Production of men´s made to measure shirts and suits for our wholesale partners. We provide a… wide range of possibilities of personalisation and optional design features including the quick production of men´s made to measure shirts in three business days without limitation of minimum quantity. 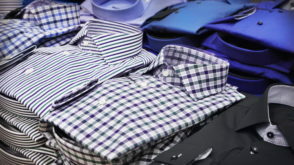 The production of made to measure shirts can be done based on body measurements, completed shirt dimensions, or by the modification of standard tabular sizes. Men´s made to measure suits can be produced using the process with one or two fittings, respectively without a fitting. Usage of corporate features (brand, respectively other supplementary adjustment) for products labelling is the matter of course. The offer includes a wide range of materials.